No Churn Neapolitan Ice Cream - Bake.Eat.Repeat. So I’m all about the frozen desserts this week. It’s because I’m on vacation and solidly into summer mode right now. Hanging out at the beach with the kids just makes you want ice cream, right? One of those perfect summer treats. Although, I’ll be honest, I could eat ice cream any time of the year. It is definitely a bit more enjoyable on a hot summer day though. Especially no churn neapolitan ice cream. Neapolitan ice cream was always my favourite type of ice cream when I was a kid. I just loved that you got three flavours all at once. My kids are totally on board with it too. The first time I made this ice cream they were SO excited to try it, and they definitely agreed with me that it’s the best flavour. Can’t beat three in one. This may be even better then the kind you buy at the store because of the summer fresh strawberries in it. 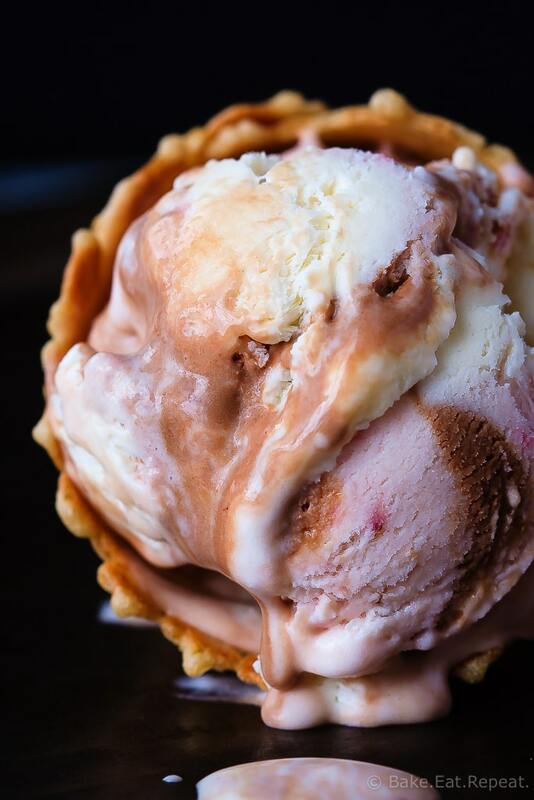 Those perfect summer berries just make the ice cream so much more flavourful. Plus you can leave some strawberry chunks in it which I think make it better. 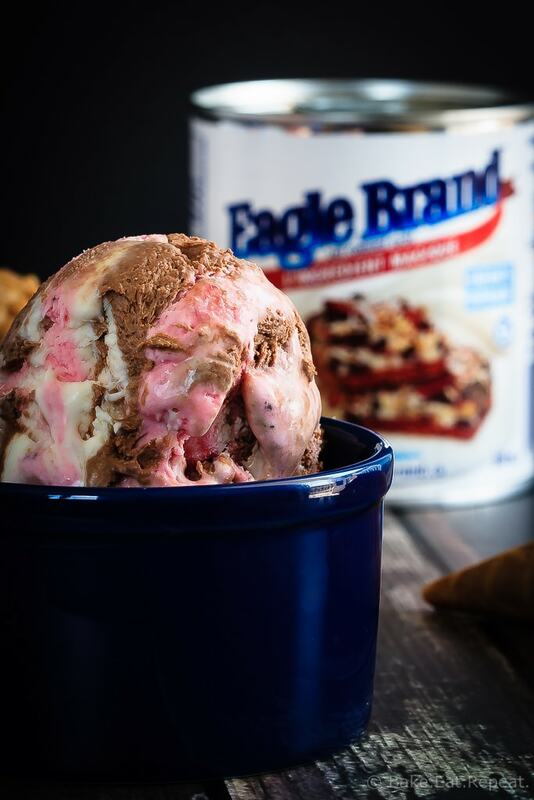 If you haven’t made no churn ice cream before, the magic ingredient in this easy summer dessert is Eagle Brand Sweetened Condensed Milk. It sweetens the ice cream and gives a smooth, creamy texture to it that makes the perfect ending to a summer meal, or as a sweet treat on a hot summer afternoon. We loved having this no churn neapolitan ice cream after going out for a bike ride or walk with the kids a few evenings in a row. It was the perfect, easy to make sweet treat to have waiting for us at the end of the day. It’s a super simple, no fuss dessert recipe perfect for summer, just like so many of the dessert recipes made with Eagle Brand Sweetened Condensed Milk. It really doesn’t get a whole lot simpler then no churn ice cream. Even neapolitan ice cream, with 3 separate flavours to make, doesn’t take long at all. Basically you beat whipping cream until it reaches the stiff peak stage, fold in some sweetened condensed milk mixed with the flavour you want, then freeze it until solid. Doesn’t get much easier. No churn neapolitan ice cream. Only five ingredients and about 15 minutes to make it. 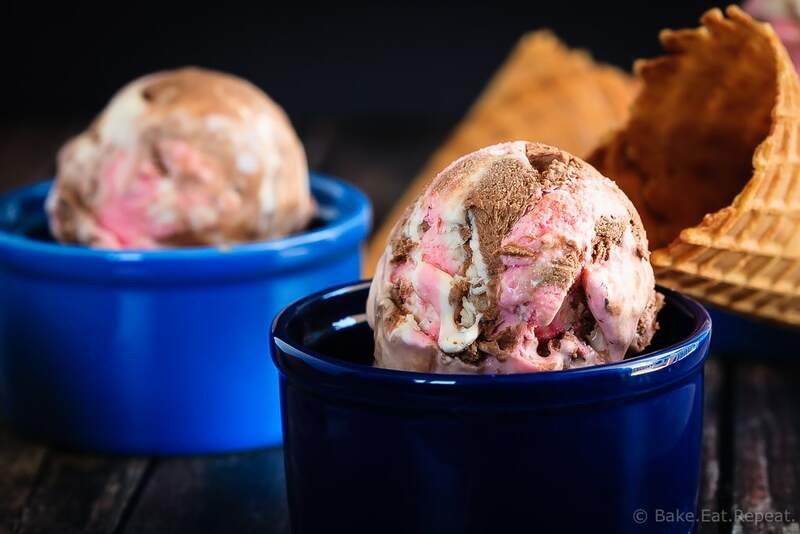 Easy, no churn Neapolitan ice cream - made with sweetened condensed milk, this mix of vanilla, chocolate and strawberry ice cream is perfectly creamy! Divide the sweetened condensed milk evenly into 3 medium bowls. Into the first bowl, whisk in 1 teaspoon vanilla, then set aside. Into the second bowl, whisk in the cocoa powder until smooth and well combined (it will be very thick) and set aside. In a blender, puree 1/2 cup of the strawberries until smooth. To the third bowl, stir in 1/2 teaspoon vanilla, the strawberry puree and the remaining diced strawberries. If you want the colour to be more intense, you can also add a few drops of red food colouring to this bowl. With an electric mixer, whip the cream until stiff peaks form. Divide the whipped cream into 3 equal portions and gently fold one portion into each of the three bowls until combined. In a freezer safe 9x5 inch loaf pan, alternate spoonfuls of the 3 mixtures until all of the cream mixture is in the pan. Cover the pan with plastic wrap and freeze until solid, at least 6 hours. Allow the ice cream to sit at room temperature for a couple of minutes before scooping to let it soften slightly. Enjoy! Neapolitan was totally my favorite flavor as a kid, too! I love the looks of this Stacey, and that last shot is just melty and gorgeous!! It is so hot here, perfect for some homemade ice cream! Great flavor, pinning to try it! yum, no churn ice creams are the best! this sounds delicious Stacey! I'm all about frozen desserts and drinks lately because it's been SO hot here! And now I'm totally craving this ice cream for breakfast! No-churn ice cream is my favorite, and I love that you made a neapolitan flavor! This looks so good, Stacey! I think I would devour this ALL in no time! This is a beautiful ice cream... love the 3 swirls of colors and flavors. Plus, your recipe is sooooo easy! My grandmother loved Neapolitan Ice Cream! She even made a Neapolitan ice cream cake once to go in a cookbook for someone! I bet she would have loved this! Thank you for the memories that these photos just brought up! I love it so much! Oh wow, I saw this on Instagram and now I'm planning on picking up the strawberries and cream so I can get on and make this when I get home from work tonight! It's so beautiful! Neapolitan ice cream usually came in three stripes next to each other in the tub when we had it when I was small (you don't see it often anymore to buy). I love how you have done it, all mixed in together. Can't wait to try it! I will take a double scoop of this please! Oh my! Absolutely yes, wish this was on my lap right now! 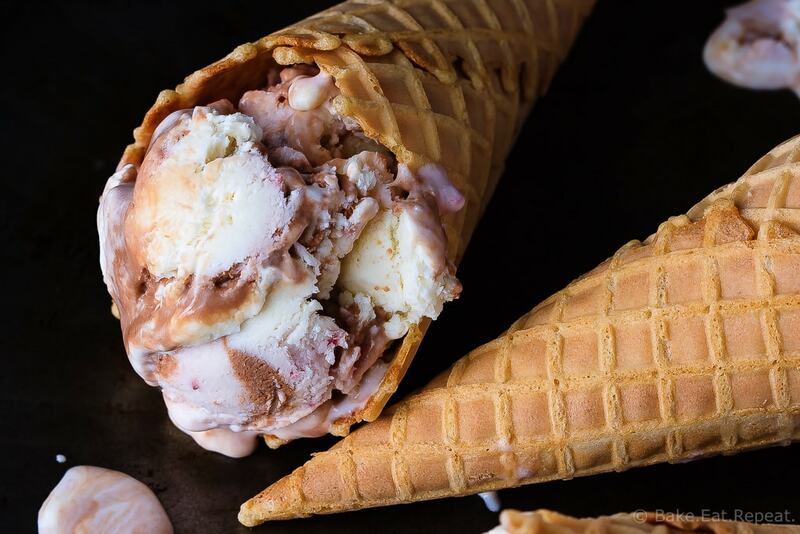 I love no-churn ice cream recipes, and that last photo is just WOW!! 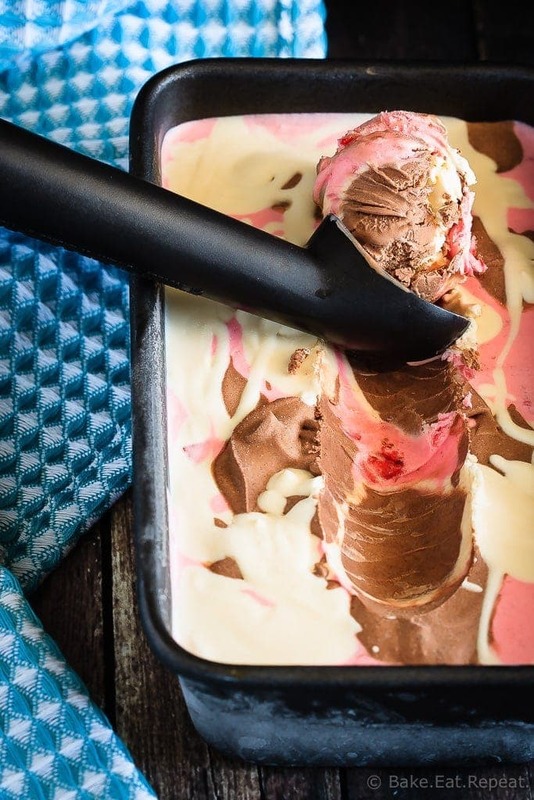 I love Neapolitan ice-cream and LOVE the simplicity of this recipe!! you can't beat 5 ingredients and 15 minutes!!! I am loving these no churn ice cream. I haven't seen neapolitan flavor yet. It also looks great!